If the widely popular Doner Kebab has one serious competitor in Germany, it’s undoubtedly the currywurst, Berlin’s no. 1 fast food. To be frank, currywurst is not just some sort of fast food, but a Berlin piece of culture served with a crispy bun. It’s easy to get and everyone simply loves it. Picture a hot Kielbasa (a type of pork sausage commonly available in Western and Central Europe) sliced in pieces, served with seasoned hot curry sauce plus sprinkled with lavish amounts of curry powder. Why is the currywurst such a central part of the German capital? It all started back in 1949 when Berlin housewife Herta Heuwer traded some spirits with British soldiers for tomato sauce. She then blended herbs and curry with the sauce and created a fantastic match between the components. The result gained quickly popularity among construction workers due to its high amount of protein and soon after made its way throughout the rest of Germany. So, but what makes a good curry sauce? The mixture of curry and herbs is important and makes often all the difference. The base is a tomato/paprika sauce with 1-2 spoons of Worchester Sauce. Each vendor creates its own curry sauce, sometimes using recipes that have passed down for generations. Lots of restaurants and food stalls offer even various versions of the sauce, from sweet to extremely spicy. A currywurst can be eaten in many different ways: the regular version (starts around 2.50-3 euros) comes usually with a bun while you can add big potatoes, sauerkraut and french fries (up to 5-6 euros). Currywurst is now widely available in Germany and usually served at 'Pommesbuden' (chip stands), especially at train stations and malls. 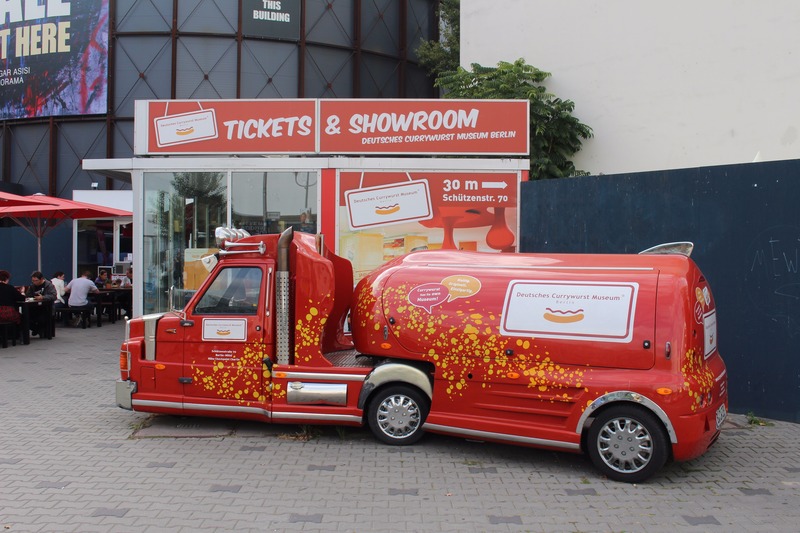 And if you plan to visit Berlin, make sure you pay a visit to the German Currywurst Museum where you learn the whole story behind the currywurst, the manufacturing process, typical ingredients plus you can sample a sausage at the end of the tour. Yes, a whole museum dedicated to the currywurst. Have you ever tried currywurst? Let me know your experience and comment below!